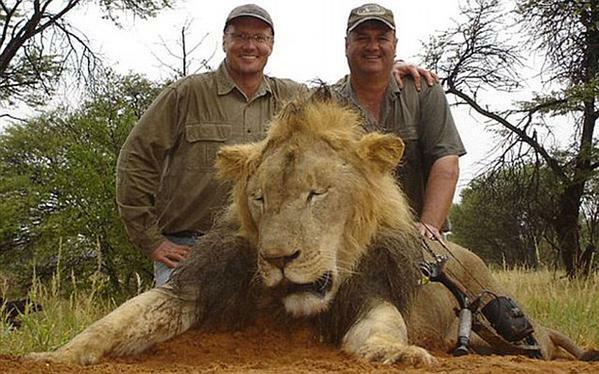 ZIMBABWE: American Dentist Exposed As Killer Of Beloved Cecil The Lion - Joe.My.God. Cecil the lion – the most famous creature in one of Zimbabwe’s national parks – was killed by an American hunter who has boasted about shooting a menagerie of animals with his bow and arrow, The Telegraph can reveal. Walter Palmer (above left), a dentist from Minnesota, is believed to have paid £35,000 to shoot and kill the much-loved lion with a bow and arrow. The animal was shot on July 1 in Hwange National Park. Two independent sources have confirmed the hunter’s identity to the paper, which has also seen a copy of the relevant hunting permit. Conservation groups in Zimbabwe reacted angrily to the news that the 13-year-old animal had been killed: partly because the lion was known to visitors and seemingly enjoyed human contact, and partly because of the way in which he was killed. He was lured out of the national park and shot. Palmer and the man who assisted him have been charged with poaching. At the link you’ll find photos of Palmer posing with other killed animals including a leopard and a white rhino. He has previously been convicted of illegally killing a black bear in Wisconsin.